This post marks 173 consecutive days with a new educational blog post. With so many folks getting in the habit of using our B&H links and our Amazon logo-links why quit now? April was a record month but May has not been so good. So far…. To show your appreciation for my efforts here, I do ask that you use our the B&H and Amazon affiliate links on the right side of the blog for all of your purchases. Please check the availability of all photographic accessories in the BIRDS AS ART Online Store, especially Gitzo tripods, Wimberley tripod heads, and the like. We sell only what I used, tested, and can depend on. We will not sell you junk. We know the tools that you need to make creating great images easy and fun. And we are always glad to answer your gear questions via e-mail. This post took 1 hour to assemble. Enjoy it! This was the lead image in BAA Bulletin #461. There I wrote, I have three problems with this image. If you think that you know what any of them are, please feel free to leave a comment. I will respond. Several folks commented but nobody hit that nail on the head. So I thought that I would run it by the blog readership as there is one very important lesson here, one that I have never seen or heard mentioned by anyone but me. I will give everyone a few days to see if they can come up with the 3 things that bug me and then I will come clean. For this version I lightened the face, bill, and neck as compared to the image that originally appeared in the Bulletin here. Please leave a comment and let us know What things about this image bother you. There is one major problem that plagues this vertical image and many horizontal images as well. As always, please be specific and explain your reasoning. Several folks who commented on this image in the Bulletin half hit the nail on the head without being able to identify the problematic concept…. Note that the illuminated red squares show the AF point sensors that were activated by 61-Point AF. Not bad at all. Note: in Breezebrowser you need to check “Show Focus Points” under View to activate this feature. To see the focus points in DPP check “AF Point” under View or hit Alt L. Hit Alt M to see Highlight Alert. To learn how and why I use DPP (Canon Digital Photo Professional) to convert my RAW files, see the info on our DPP RAW Conversion Guide here. Note the histogram with the WHITEs well into the rightmost histogram box. Regular readers know that I use and depend on BreezeBrowser every day of the year. 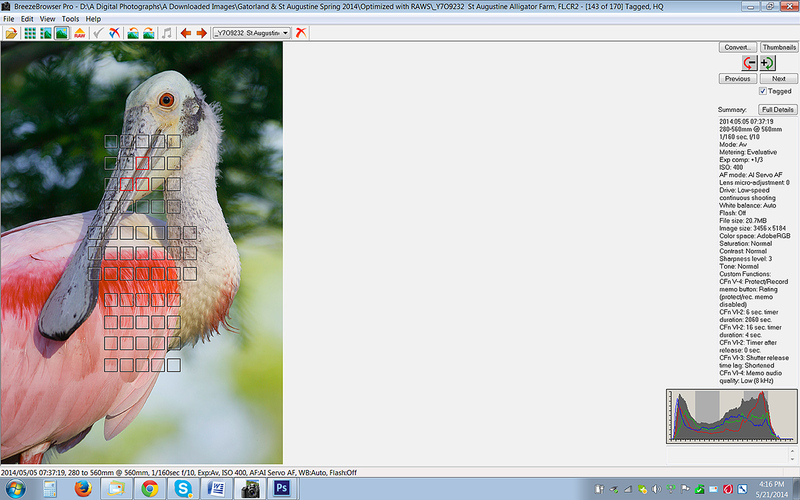 It allows me to sort my keepers and delete the rejects faster than any other Windows browsing program. We use it on the main computer in the home office to catalog our images file-drawer style. And the companion program, Downloader Pro allows me to download my images quickly and conveniently. It automatically adds my IPTC data and the shooting location. I have it set up to create a folder named by the Month/date/year. The Breezebrowser/Downloader Pro combo saves me many hours each week. To learn more or to purchase this great PC only program, click here. As far as the BreezeBrowser/Downloader Pro Combo goes, if you are using a Windows platform and are not using these two great programs you are at best, wasting your valuable time. My understanding is that Photo Mechanic is best for Mac-users who do not opt to run Parallels or VM Ware fusion on their Macs so that they can enjoy the many advantages of BreezeBrowser. See BreezeBrowswer on a Mac for details. If you do not know how and when to use 61-Point then you need a copy of either the 1D X AF Guide or the 5D Mark III User’s Guide. And here’s the great news: purchase either camera using one of our B&H Affiliate links, send me your B&H receipt via e-mail and I will be glad to send you a free copy of the corresponding eGuide. Buy both and get two free e-Guides. I own and use two EOS-1D X bodies and one EOS-5D Mark III body. The lowdown on the Canon 400mm f/4 IS DO(E) (Diffractive Optical Elements) Lens. Both of these items are priced to sell fast! I don’t like the two triangles formed by the body, neck and head. The bright triangle and the grey shadow on the body. Too many wrong areas to divert your eye. What bothers me in the photo is the scruffy looking feathers on the neck. This is caused by strong contrast of fine white and black feathers. Also on the shoulder of the bird is a patch which looks oversharpend due to strong contrast of dark pink and white fine feathers. Although I’ve been lurking for years, this is my 1st shot at one of these so please be gentle. 1) It appears to me that the shadows (from the bill and behind the neck) are coming from two differnt directions. 2) I also think I might prefer the eye in the top right “rule of thirds” position with consistent background (all foliage or all sky), but I’d have to see a comparison to decide. 3) I like the bit of leg. It “grounds” the bird for me. 2 The dark branch in the background going through the head of the bird. 3 and eeeeerr.. the branch mentioned in point 2, the dividing line from point 1, together with the bill direction of the birs, seems to form diagonal lines that leads the eye out of the image. ps: revelations probably early next week at the latest. 1. The specular highlights caused by the sky between the leaves of the tree. 1. and 2. do not bug me. 3.not a flower: just sunlit vegetation. 4. agree. I lightened it a bit too much. See the original post. However, that was not one of my original three :). I can be just as “off” as the others, so here goes. I thought you liked the eye “looking off a bit”, not just straight at you. And the darn bill is in the center of the image, the least attractive feature of the Spoonbill draws ones eye to it. Why not put it off center by adding some canvas at the top. How about more space on the left side. And maybe the branch at the top let corner? 1) The tip of the bird’s bill is OOF – not sure what could be done about that – would need lots of DOF – probably not available. 2) The green cast/tint on the bird’s head – probably light reflected from the foliage? 3) Really digging here – might be the crop (of the image not the bird’s) being a tad too tight? This is a very handsome portrait. Show more of the leg or crop just above it. I considered the sharp transition from the dark green vegetation, as suggested by others, as one of the top three, but second guessed my self. The bright spot just above the left of the bird’s head is a bit distracting. The coloration of this species is very interesting. 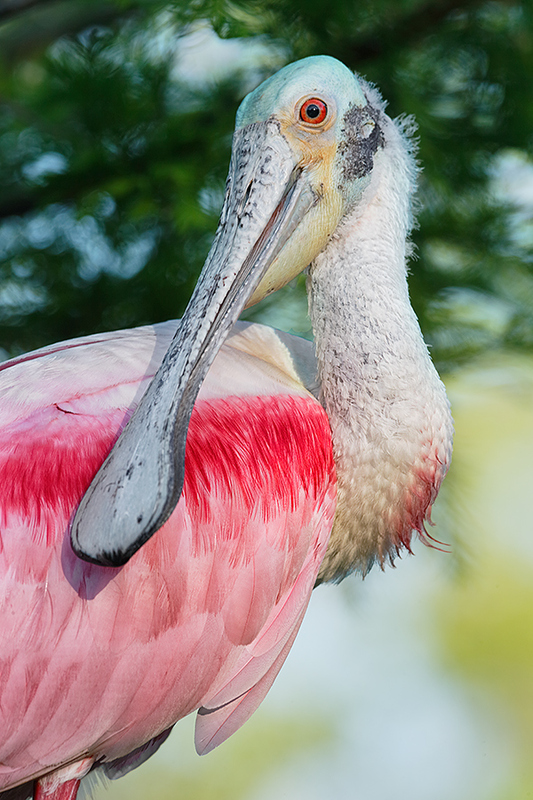 Do these birds eat a significant quantity of pink creatures (like flamingos and brine shrimp), thus taking on the lovely pink color? Do they eat green food that colors the green feathers? I am not asking if spoon bills eat flamingos! I think the abrupt transition of the bird’s head/neck to the background gives a pronounced appearance of being superimposed onto the background (even though it isn’t) creating too much separation. I would have also cropped up a bit on the lower part of the frame to leave the leg out? I don’t quite see any value in its inclusion. That said – I so appreciate your work kind sir! Perhaps the shadow bothers you as the bird is off your preferred sun angle. I think in the blog you mentioned the lower right is the sky? I’ll say how the sky and tree line intersect the neck.